The United Nations Office of the High Commissioner for Human Rights (OHCHR) held an Open House Day on September 14, 2013. The gathering was titled “1993-2013: 20 years defending your rights.” Falun Gong practitioners from Geneva, Switzerland and other areas attended the event to raise awareness about the persecution of Falun Gong in China. The event was held in the historic Palais Wilson building, where the general public was treated to a series of activities, including seminars, tours, and live performances. Before the seminar started, Dr. Shizhong Chen, a representative of Falun Gong, stepped up to the podium to give a brief overview of the Chinese Communist Party's (CCP) ongoing persecution of Falun Gong in China. After he spoke, an official from the OHCHR expressed her concern for Falun Gong and asked several relevant officials to look deeper into the matter. After the main presentation concluded, attendees were invited to come on stage to speak. 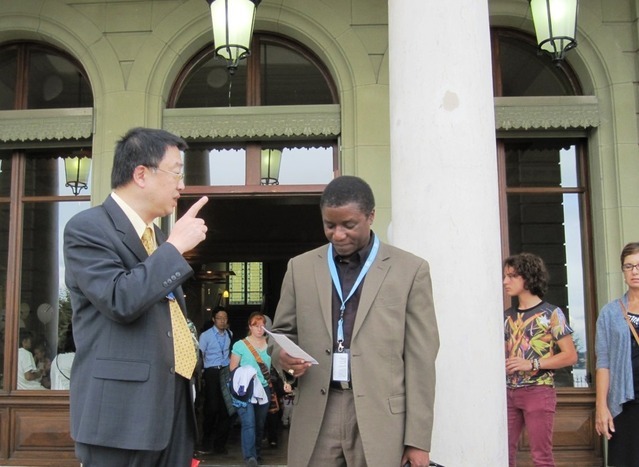 Dr. Chen stated, “I want to pass on a message that I received from a Falun Gong practitioner, before I left for Geneva. Dr. Chen pointed out that the Chinese regime not only tries to force female practitioners to give up their belief in Falun Gong or face severe abuse and torture, but it also forces many pregnant practitioners to renounce their belief or risk having their unborn child forcibly aborted. Ms. Xiaotian Zhang, a Canadian practitioner, said that there are countless stories of female practitioners being abused in China. Mr. Karim Lahidji, one of the event participants, said that a secretive regime like the CCP poses a grave threat to universal human rights in the world. Despite the CCP’s claim of “reform and opening up,” it has repeatedly rejected international scrutiny of its human rights situation, and refused to allow a UN High Commissioner's investigation into China's alleged human rights violations. Noting how difficult and dangerous it is to report on human rights abuses in China, Mr. Lahidji expressed his great admiration for Falun Gong practitioners' undaunted courage to expose the regime's crimes against humanity. The second seminar, “Reprisals Against Those Who Collaborate with the UN to Denounce Human Rights Abuses,” included guest speakers Professor Chaloka Beyani, a Zambian national and professor of International Law at the London School of Economics, who was appointed UN Special Rapporteur on the Human Rights of Internally Displaced Persons in 2010, Mr. Phil Lynch, Director of the International Service for Human Rights (ISHR), a leading Geneva-based international NGO, and Mr. Hassan Shire Sheikh, a human rights defender in Uganda. All three speakers agreed that when a totalitarian regime is exposed for violating human rights, its usual recourse is to severely punish the whistle blowers. They said that this directly threatens the advancement of human rights in the international community. Dr. Chen pointed out that the more evil the crime that's being exposed, the more vicious and revengeful a regime will behave towards those who exposed it. When the CCP's crime of organ harvesting from living Falun Gong practitioners was exposed, not only was it regarded as a most grievous human rights violation—and definitely a new low in human morality—but it also disrupted the Party's lucrative black market organ trade. This made the Party even more vindictive than ever towards Falun Gong and any individual, group, or organization that dared to support Falun Gong. Dr. Chen gave an example of at least one group that had its UN consultative status canceled, and two groups that had been threatened for helping Falun Gong arrange to speak at the UN regarding China's human rights violations. During the 2009 Human Rights Council conference, Chinese delegates made fools out of themselves and the entire CCP by repeatedly trying to prevent Dr. Chen from speaking out to expose the persecution in China. It was clear to many of the event participants that the CCP was recklessly striking out at Falun Gong for exposing the Party's crimes. Mr. Sheikh applauded Dr. Chen’s remarks and noted that he had similar experiences while working on the United Nations Human Rights Committee, which reviews NGOs. He said that the Chinese regime, along with other regimes that are known human rights violators, try to dominate the Committee.